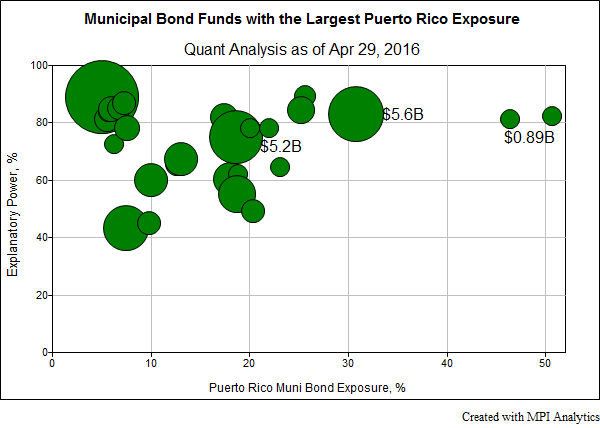 How exposed are U.S. Municipal Bond funds to a Puerto Rican default? In light of the Governor of Puerto Rico announcing the possibility of further defaults, MPI wanted to understand the possible effects on U.S. mutual funds that invest in Puerto Rican municipal bonds. We ran quantitative analysis on all of Morningstar’s municipal bond categories, analyzing the return streams of 562 funds identifying potential exposures ranging as high as 50%1 in 29 funds from a small cluster of fund families, including Goldman Sachs, Franklin and Oppenheimer, whose Puerto Rican bond exposures were the subject of a December 2015 Bloomberg article.